Choosing to undergo back surgery is not a decision to take lightly. Even minor operations require a good deal of discussion and careful consideration between the surgeon and patient beforehand. Why? Virtually any invasive procedure carries some risk for complications. Most surgeons will require their patients to exhaust conservative treatment options first–including medications, injections, and physical therapy–before deciding to go under the knife. Of course, this is not to say that surgery is never indicated. Hundreds of thousands of people every year undergo spinal surgery as a “last resort” when conservative measures don’t work. However, it’s been estimated that as many as 20% of these people fail to achieve a significant improvement in their back pain. This failure of symptom relief following back surgery is often called post lumbar laminectomy syndrome. Why Do Some Back Surgeries Fail to Relieve Symptoms or Improve Function? If you’ve had back surgery and have failed to see any meaningful improvement in your pain and dysfunction, there could be several reasons why you’re dealing with this. Recurring or continued nerve root compression, for instance, may be present. Likewise, there could be ongoing inflammation and/or scar tissue formation. Mobility and stability issues within nearby spinal joints could also be to blame. Lastly, persistent back pain–even after a back surgery intended to relieve a person’s suffering–may be related to, if not directly caused by, other underlying conditions including diabetes, peripheral vascular disease, depression, anxiety, autoimmune disorders, sleep disorders, and smoking. Understandably, the emotional, physical, and even financial implications of post lumbar laminectomy syndrome can be quite serious. At Progressive Spine & Sports Medicine, our Ramsey pain management team, led by Dr. Steven Ferrer and Dr. Kevin McElroy can offer several comprehensive treatment options that can get you the relief you’ve been hoping for and give you some much needed peace of mind. Spinal cord stimulation (SCS) is a neuromodulation technique that can reduce pain that is generated by an overly or abnormally firing nervous system (which may occur as a result of the stress and trauma associated with surgery or even a history of chronic back pain). Spinal cord stimulation requires the implantation of a small device (similar to a pacemaker) near the spine. This device emits tiny electrical impulses that effectively prevent pain signals from being sent to the brain. Physical therapy is another common option for people recovering from back surgery (failed or otherwise). Our physical therapy team can provide specific exercises and manual techniques that promote tissue healing, reduce scar tissue formation and adhesions, normalize the alignment of the spine, improve spinal stability, and maximize the efficiency and motor control of key postural muscles with the trunk and pelvis. Have you had back surgery and are not satisfied with your post-operative outcomes thus far? Are you looking for effective, affordable, and non-surgical ways to improve your back pain and related symptoms? If so, we invite you to call Progressive Spine & Sports Medicine, Northern New Jersey’s premier multidisciplinary pain management facility serving Ramsey and surrounding communities. To schedule an initial consultation or to learn more about our comprehensive pain management services, call us today at 201 962 9199. With decades of combined clinical experience behind them, Ramsey pain doctors Dr. Kevin McElroy and Dr. Steven Ferrer have worked with hundreds of men and women struggling with dysfunction related to spinal stenosis. If you have recently been diagnosed with this condition or are simply wondering what’s causing your pain, then we invite you to visit Progressive Spine & Sports Medicine for answers–and help. What is Spinal Stenosis & How is it Diagnosed? Spinal stenosis is a progressive condition that causes a narrowing of the spinal canal and/or spaces between the vertebral bones through which the spinal cord and spinal nerves travel. As this space narrows, nervous tissue can become pinched, leading to a variety of symptoms discussed subsequently. Spinal stenosis can be diagnosed based on a comprehensive physical examination, patient history, and diagnostic imaging. It’s typically caused by degenerative changes in the spine such as arthritis or degenerative disc disease, but in rarer cases may be caused by factors such as trauma, tumors, and certain bone or connective tissue diseases. Everyone who comes to see us for help with spinal stenosis tends to present with slight variations in their symptom presentation. The exact signs and symptoms will depend on what’s causing the stenosis, which nerves (if any) are being impinged upon, and how severe the degree of stenosis is. With stenosis, a person’s back pain and other symptoms may improve if a person bends forwards or walks around a little bit. In extremely rare cases of severe stenosis, the distal part of a person’s spinal cord may become so compressed that a person experiences symptoms such as incontinence, saddle anesthesia (numbness in the groin and perianal area), and/or sexual dysfunction. This is called cauda equina syndrome and is considered a medical emergency. If you notice any of these symptoms, then call 911 right away. If I Have Spinal Stenosis, What Kind of Treatment Options are Available to Me? At our pain management clinic in Ramsey, NJ you’re more than just your diagnosis. Whether you come to us for help from spinal stenosis or any of the many other conditions we treat, we’re confident that we can devise a custom-tailored treatment plan to meet your unique needs and address your individual challenges. The goals of treatment is to reduce pressure on compressed nerves, maximize spinal mobility and spinal joint space, reduce symptoms, and maximize function. We’ll adjust our treatment as necessary to meet your changing needs and help you get back to your normal active lifestyle. In the rare cases where surgery may be indicated, our team can help connect you with the right providers to meet your needs. Dr. Ferrer and Dr. McElroy, along with the rest of their multidisciplinary team, are committed to helping every one of their patients maximize their quality of life through effective symptom management and prevention of recurring problems. To schedule an initial consultation or to learn more about our pain management services, then call Progressive Spine & Sports Medicine today at 201 962 9199. Progressive Spine & Sports Medicine is one of New Jersey’s most comprehensive and advanced pain management facilities. We offer non-surgical orthopedic and therapeutic care to Ramsey and the surrounding Bergen County communities. Back pain and related issues are one of the most common diagnoses our team works with; indeed, research indicates that up to 8 out of 10 of us will experience at least one episode of back pain over the course of our lives. Throughout their years of clinical practice, Progressive Spine & Sports co-founders Dr. Steven Ferrer and Dr. Kevin McElroy have fielded many questions about one particular health concern known as sciatica. It’s almost a buzz word in the back pain world. Many patients wonder if their symptoms are caused by this disorder, even if they’re not completely sure what the disorder is. Sciatica: What is it, Exactly? Understanding sciatica requires a bit of understanding about the human spine. In your lower back, you have 2 large nerves which exit on the right and left side of the spinal column. These nerves go on to branch out and provide innervation (sensory and motor) to the right and left leg. These nerves are called sciatic nerves. Sometimes, one of your sciatic nerves can become impinged or pinched. This can happen due to a variety of factors, including disc herniation, disc bulge, degenerative joint disease, bone spur, or in rare cases a tumor. Another cause of sciatic nerve impingement is a muscle injury known as piriformis syndrome. The piriformis is a muscle in your hip through which the sciatic nerve travels. It’s important to understand that the phrase “sciatica” doesn’t actually describe a particular health problem itself. Instead, it’s a useful term for describing a syndrome of symptoms that a person may have when the sciatic nerve becomes irritated. Why does this matter? Because determining the exact underlying cause of your sciatica symptoms can help guide treatment. Not everyone with sciatica requires the same treatment. This is true not only because the underlying cause could be different from person to person, but also because symptoms can vary significantly, as well. Certain people may be more at risk for developing sciatica compared to others. This includes anyone with a sedentary job or who sit for long periods of time, people between the ages of 30 and 50, people with diabetes, and people who are overweight. The goal of conservative management of sciatica (and its underlying cause) is to ultimately reduce or eliminate the source of pressure on the sciatic nerve. Once this relief is provided, proper healing and symptom resolution can begin. After determining your underlying diagnosis, our team will be able to customize your treatment plan to maximize your recovery and prevent recurrence. To do this, we may use a combination of non-surgical strategies, including physical therapy, interventional pain injections, myofascial release, acupuncture, and more. We’ll work with you every step of the way to ensure we’re finding solutions that safely and effectively meet your needs. Wondering if you have sciatica? Tired of struggling with frustrating and debilitating symptoms? Call Progressive Spine & Sports Medicine today at (201) 962-9199 to schedule a consultation. Back pain doesn’t have to mean a lifetime of suffering. Most causes of back pain can be treated nonsurgically with excellent results. That’s why we’re happy to present this information – in hopes that it will help you live pain free. If you struggle with low back pain, you’re in good company. Research suggests that 70-80% of the population will experience at least one episode of low back pain over the course of their lifetime. Plus, it’s been listed as one of the top causes of disability and missed work, and can affect people of all ages – though the majority of people who suffer from low back pain tend to be between the ages of 35 and 55, and men seem to be more likely to develop back pain. Other known risk factors include stress and poor coping skills, depression, obesity, smoking, and poor posture or body mechanics. Episodes of low back pain can resolve on their own, however if left untreated it’s more likely that back pain will recur or develop into a chronic problem. While some people ultimately require surgery to resolve their symptoms, it’s generally recommended that most should explore conservative treatment options first. At our pain management clinic, we offer a variety of non-surgical options including physical therapy, massage therapy, and injections. Our treatment options have made a significant impact on our patients’ function and quality of life, without exposing them to the added risks inherent with invasive surgical procedures. In many cases, the exact underlying cause of a person’s low back pain symptoms is not always obvious. Interestingly, this is not necessarily a barrier to healing. Current evidence from physical therapy research suggests that designing a treatment plan based on symptoms rather than diagnosis can significantly improve outcomes and reduce disability. This is especially important for those patients who have inconclusive diagnostic results that don’t paint a clear picture of what’s really going on. Deciding to undergo surgery is a big deal and requires a lot of consideration and input from your medical doctor, your surgeon, yourself, and even your loved ones. Back surgery is generally only recommended if a person’s back pain has not improved after extensive conservative treatment, and if a specific diagnosis is available. Studies also suggest that people who have wide reaching symptoms – like pain extending into their legs – tend to do better after surgery compared to people with symptoms only in their back. Physical Therapy: We have a staff of board-certified physical therapists who offer a variety of therapeutic options. These may include corrective exercises to increase the strength, flexibility, and endurance of your postural muscles; spinal decompression and joint mobilizations to reduce pressure on spinal discs and nerves; modalities like ultrasound, electrical stimulation, and ice to relieve pain and inflammation; and body mechanics and postural re-training to prevent recurrence. Massage Therapy: Our licensed massage therapists promote healing by relaxing muscle spasms, mobilizing soft tissue, and increasing blood flow and lymphatic drainage around the low back. Massage therapy also has a positive and calming effect on the brain, which can promote better sleep, stress relief, and improved mood. Injections: Steroids are a powerful anti-inflammatory medication. When injected into your spine, these steroids can significantly reduce pain, swelling, and inflammation. Not only can this relieve your symptoms, but it can also allow you to participate more with your physical therapy, further maximizing your functional outcomes. Are You Ready to Take “Back” Your Health? We are a comprehensive Pain Management and Sports Medicine clinic offering non-surgical solutions to low back pain and other causes of dysfunction for the people of Ramsey, NJ and surrounding communities in Bergen County and NYC. If you or a loved one is struggling with low back pain, call our staff today to request an appointment or to learn more about our services. We look forward to working with you, and helping you live pain free! Common Injuries: What is a Herniated Disc? This post is part of our ongoing series to educate our patients about common injuries and how they can be treated with our nonsurgical techniques. It’s all part of our commitment to helping you live pain free. Herniated discs affect millions of Americans and is one of the leading causes of low back pain. A disc is the cushion between the bones in the back. Normally there is a tough outer part (the annulus) that keeps the softer inner part (the nuclues) inside. It is very similar to a jelly doughnut where, under normal conditions, the jelly remains inside the doughnut. A disc herniation is when the nucleus (the jelly) pushes through the annulus (the doughnut). 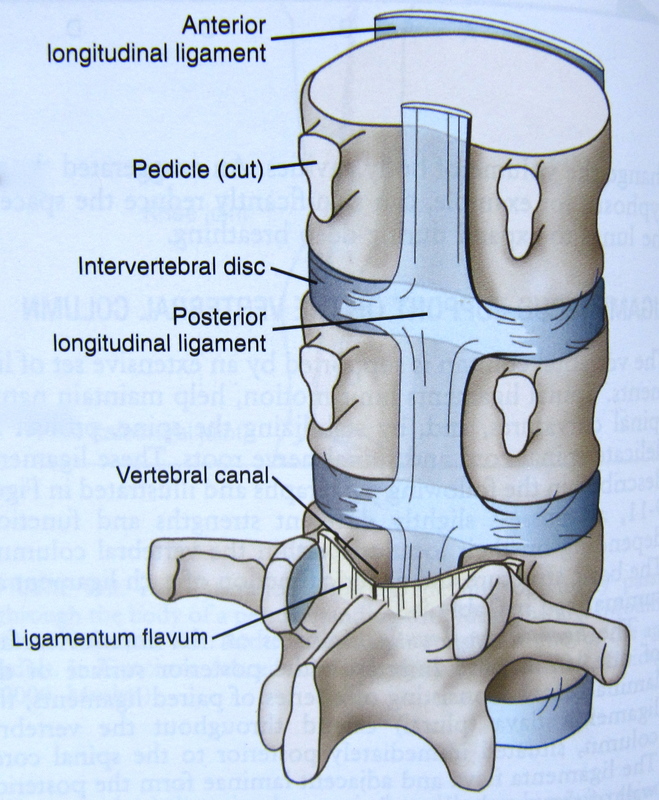 Most disc herniations occur between the ages of 30 and 50. There are two main reasons herniations occur in this age group. The first is that the discs loss some of their water content as a person ages. This causes them to be more susceptible to tearing, which allows for the inside disc material (the nucleus) to herniate. The second reason is that the posterior longitudinal ligament, which is the ligament in the back of the discs that helps to keep the discs intact, begins to generate and makes the discs more likely to herniate. It is more common to not know exactly when the disc was herniated, but some patients can feel a disc herniated when lifting and twisting or from trauma, like a car accident. Our pain management doctors in Ramsey, NJ can easily diagnose a herniated disc. You will be asked questions about your pain including when it started, what it feels like, and what makes it better or worse. Your doctor will examine you and will focus on feeling your neck or back while also checking your strength, sensation, and reflexes. The history and physical exam is usually enough to make the diagnosis of a herniated disc, but other testing may some times be required, especially if your pain doesn’t improve with appropriate conservative treatment. X-ray – A herniated disc can not be seen on x-ray, but an x-ray is a valuable tool in helping to assess other causes of pain incluiding a fracture or arthritis. MRI – An MRI is the gold standard for assessing a herniated disc. The detail in an MRI allows your doctor to see which disc is involved and which nerve may be affected. EMG/NCS – Electromyography and nerve conduction studies are examinations of your body’s muscles and nerves. The advantage of this exam is that it assesses the actual function of the nerves that can be affected. Most patients improve with conservative treatment and very few require surgery. Medications that have been proven to be effective include anti-inflammatories and muscle relaxants. The most important aspect of treatment for a herniated disc is physical therapy. The initial focus of physical therapy is on pain relief. Once that is accomplished, the patient will progress to working on range of motion and strengthening the core muscles in the low back, hips, and abdomen. If conservative treatment does not result in improvement in your pain, an epidural injection may be recommended. Epidural injections deliver potent anti-inflammatory medication directly to the site of the disc herniation and irritated nerve. These injections are done with live spinal imaging to help guide the needle safely to the site of the disc herniation. At Progressive Spine and Sports Medicine, we specialize in nonsurgical pain management, and a herniated disc is just one of the many injuries we diagnose and treat in our Ramsey, NJ medical center. For more information, please see our full list of our nonsurgical services, or to schedule a consultation, contact us today.